Tales of a Pee Dee Mama: Which way are we going? To be successful in life, one needs to have goals - a direction in order to avoid aimless wandering through life. The same is true in homeschooling. Early on in our homeschooling life, Robb and I talked about the goals we wanted to have for our children through homeschooling. Of course we want them to do well academically and to become good citizens, but what does that mean? I thoroughly research our curriculum choices each year. I take into account each child's strengths and weaknesses to choose the right curriculum for each subject. I look for what will challenge them to grow, will push them to work hard. Math, reading, science, history, foreign language, grammar - there are so many different options out there to choose from! I couldn't imagine trying to choose my curriculum without knowing the direction in which I wanted to go. Even more important to me than developing strong academic children is developing strong citizens. I look for opportunities where they can learn to serve others. One of our favorite field trips each year is volunteering at the local Special Olympics. They also are involved in many activities outside of school where they develop friendships - boy scouts, soccer, ballet, softball, etc. Do you know which way you're going? How wonderful that you're volunteering with your little ones. Talk about setting great direction for life. It's been a lot of fun volunteering with them. I can't wait until my youngest is a little older because there will be more opportunities for us to serve then. Good for you! And your children. I admire those who can home school. 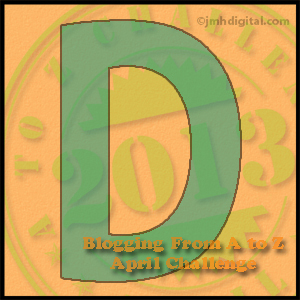 Enjoy the A-Z! So great TaMAra that you use the strengths and weaknesses of each child to encourage them in the direction that will challenge them! And to emphasise being good citizens - how great is that! In service - to our fellow man/woman. It's very important to me that I tailor the education of each of my children to help them become the best they can. Volunteering is a very imporant thing to teach kids. I am involved with many volunteer positions and I've always dragged my kids along with me. They're both good at picking out things they can do on their own now. It certainly helps broaden their perspective on the world and their part in it. Now that my son is older, it's nice to see him start to pick out his own volunteering projects. Sounds like your home would be a great classroom to learn in. And your field trips seem fun and rewarding. That's what I'm striving for. I want my small people to enjoy learning. We have similar goals. I am flexible with my curriculum and lessons, tailoring learning to the strengths and needs of each child. We also focus on serving others. Just last week the kiddos were involved with a little entertainment. My parents are in their 80's and my father is a musician. My mother and father play music for the "old" people at the assisted living homes in our area. On occasion, my children tag along to play music and dance with the elderly people. I watched my little kiddos serving the people birthday cake and punch. I watched them play music and interact with the residence and thought, "This is what homeschooling is about." Homeschooling is about so much more than academics. It's learning compassion and how to serve others! That IS what homeschooling is about - helping our children learn through all of life's experiences, not just the academics. Sounds like they had a great time! Wow, that's great what you're doing with your kids. I agree - direction is very important. Sometimes I feel like I've been floating for far too long. Where do you feel like you need direction the most? Start there, and you might lose that "floating" feeling. Love this post on direction and homeschooling! My family's homeschooling goals include growing a heart of service for others and citizenship too. We volunteer in small ways throughout the year, singing Christmas carols at a nursing home, socializing stray cats at a cat rescue, picking up trash on the roadside, and other things. Nice to meet you through A to Z! Another homeschooler! Great to meet you! Heading off now to check out your blog. Thanks for your kind words. I thoroughly enjoy teaching my children more than just the academics. I've been directionless my whole life, but it has taken me many places. I can tell you it was really hard choosing subjects without knowing what I wanted to do. When I finally made a decision I wasn't accepted - so I ended up going where other people suggested. It took me a long time to find here. I love the idea of homeschooling, if I had kids I like to be able to do it. Sometimes being directionless can lead to some interesting places and opportunities! There are times in our lives when that happens. Where do you want to be headed? I can see how you'd need direction - one reason why homeschooling kids may not work for me. I'd be making tea all the time.. I love your dedicated approach to home schooling! I know two moms that have home schooled, and unfortunately, neither of them took it very seriously, and the kids suffered for it. I can easily see that your kids are getting a wonderful, rounded education! Homeschooling definitely takes dedication. Without it, it's easy to burn out or do a poor job.